Home / Life After The Refuge / Faro.. When we went on holiday to see our friends in Carcassonne in June 2015, we weren’t on the look out for a dog. 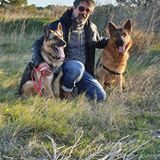 We went to the SPA with my friend who volunteers, to do some dog walking – and we met Faro. A little black, rough haired doggie who was terrified of his own shadow and even more terrified of men… but beautifully well behaved on the lead, he just kept looking up at me with those wide eyes. We were smitten. When we got home, we couldn’t stop thinking about him hiding in the back of his kennel, and three weeks later had reserved him and arranged travel back to Carcassonne to fetch him. In my ignorance, I just thought he would love being in a warm loving home on a fleecy blanket with lots of yummy food… but no… to him the SPA Kennel was safety from whatever he had endured in a previous life. 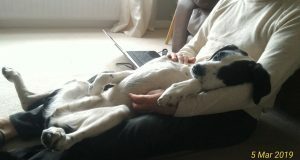 He barely moved from the sofa for some time and we had to build his trust and confidence very slowly. Television was super scary and squeaky balls had to be put away. 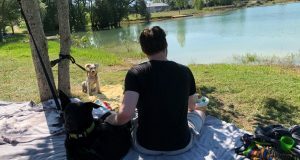 But he always loved being with other dogs and our fantastic dog walker quickly became a third trusted person in his life. It took some time but I can honestly say it is the best thing we have ever done – Faro has changed our lives and we love him unconditionally. His trust and loyalty in us is amazing and he is now a lively and loving dog who loves nothing more than a big run and then to curl up with his head on your lap (and he now loves a squeaky ball too!!). He still has his nervous moments and doesn’t 100% trust everyone but his progress is incredible and you wouldn’t recognise him as the same dog. He has even been to France on holiday with us last year and took a visit back to the SPA. The team at the SPA and DRC do an incredible job and their advice and support was fantastic. 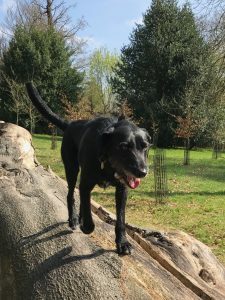 The best piece of advice was to use a harness and double lead – I can’t imagine what he would have done if he had pulled out of his collar in those very early nervous days. I thoroughly recommend adopting a rescue dog and giving them a new life – we would do it all over again. Faro…enjoying life like all dogs should! Next: Three dogs leave for new homes!